Look! It's thin! THIN, WE TELL YOU. Alcatel thinks it can mix with the big boys by rivalling Apple and Samsung's smartphone headliners. 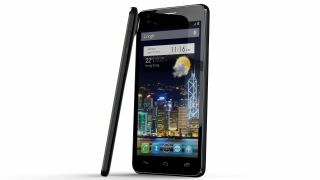 The new range launched at CES 2013, from the brand known mostly for its budget handsets, comprises of three models: the One Touch Idol Ultra, the One Touch Idol and the One Touch Scribe HD. The first is the headliner: the Idol Ultra promises a thickness of just 6.45mm, making it the 'thinnest smartphone in the world', although looking at that protruding 8MP camera, we'd be inclined to think it's probably only at its thinnest point. It's also running Android Jelly Bean on top of a 1.2GHz dual core processor; not the most powerful out there, but you do get a 4.7-inch HD OLED screen to look at it with, so it's one for those that value form over power. If you're more about the raw grunt (and covet the Samsung Galaxy Note 2 but can't afford it) then the One Touch Scribe HD may be more your cup of tea, especially if you like crayon-like styluses. Coming with a 5-inch HD screen (presumably LCD, as Alcatel has furnished us with very little in the way of specifications) and the quad core MediaTek MT6589, which comes with lower power than rival quad core chips and should push the price down accordingly. It, too, has an 8MP camera and comes with a 4G connection as well, meaning the likes of EE in the UK may be looking to get their speedy mitts on it. And finally: the Alcatel One Touch Idol. It's a phone that is apparently another record breaker, coming in at 110g to make it the "lightest smartphone in its category"… although we've no idea what category that might be, as there are plenty of lighter smartphones out there. Like its Ultra brother, it has a 4.7-inch screen but this time only uses IPS LCD technology, meaning less rich contrast ratios. It's also go an 8MP camera, runs Jelly Bean and is offered in 'premium brushed metallic finishes'. There's no specific territorial information on offer here about these phones, other than they'll be released in 2013 (wow) globally. We're pressing for more info… namely how much these 'record breakers' will cost.